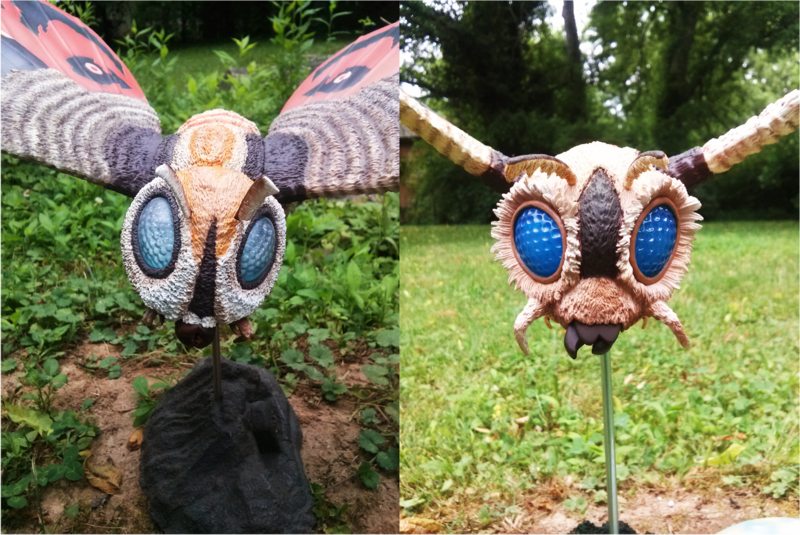 X-PLUS 25cm MOTHRA 1964 Is Here! Complete Gallery of Comparisons With The X-Plus Mothra 1961! It’s a Collector’s Update & Review! – SKREEONK! Happy Friday to you AND to me, fandom! I think it is safe to assume that signing up for direct withdrawal via PayPal for HobbySearch orders 100% guarantees you’ll be the first to receive a figure stateside. My X-Plus 25cm Mothra 1964 arrived promptly this morning, and she is a BEAUT! My morning consisted of taking this gorgeous new figure outside with her previous 1961 counterpart for some comparison shots between the two. Honestly, I think the best way to review this figure is by comparing it to X-Plus’ first Mothra Imago outing in vinyl: the aforementioned 25cm Mothra 1961. Right off the bat when you see this figure in person – you’ll notice the eyes. The 1964 has a set of gorgeous, deep royal blue bug eyes on her glorious head sculpt – as compared to the classic baby blues of the ’61. 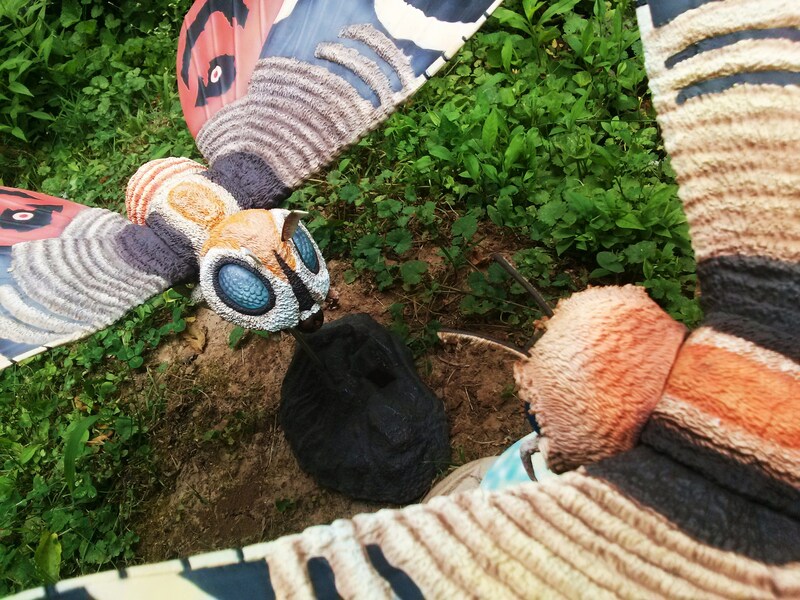 They may not catch light as well as the lighter eyes on the ’61, but the deep, vibrant blue really punches in contrast with the warm colors that populate the rest of Mothra’s visage. Right above the eyes you’ll find the antennae, which are an absolute b*tch to rotate. For those who receive this figure: The antennae arrive backwards just like the 1961’s did – and you will need to rotate them downward. PLEASE use a hairdryer to the top of the head (try not to heat the eyes) before rotating or you’ll snap one of these off. Turn them inward toward each other, the slant of their placement allows them to turn in much better than out. Comparison shot of the X-Plus Mothra 1961 and the new 1964 – from Jon @ UnCanny’s collection. Now, on to the body! Many people speculated when this figure was first announced that we’d just be getting a new head sculpt popped onto the 61’s body – but I am here to confirm everything we discussed on the last FRESH VINYL LIVE and say that she is a 100% new figure! The wing tips are pointed as opposed to the rounded wings of the 1961, and every other square inch of this sweet, sweet sculpt is brand new. I have heard from several sources, however, that the original sculpt and mold were indeed altered to create the 1964 – so if you have a 1961 it just became a much more rare collector’s item as the mold no longer exists! As stated, her legs are a brand new sculpt, as is the abdomen, thorax, wings, and – of course: her incredible head sculpt. The detail will blow you away in person. Every little hair is sculpted and painted individually. X-Plus truly knocked this one out of the park, and I’ve included a full gallery of photos at the end of this article to showcase such. What about the base, you ask? After all – it’s all about that base, ’bout that base – No Tre… Yeah I can’t. Anyway – The base is enormous when compared to the 1961’s – as it should be! For what is this base responsible for holding? 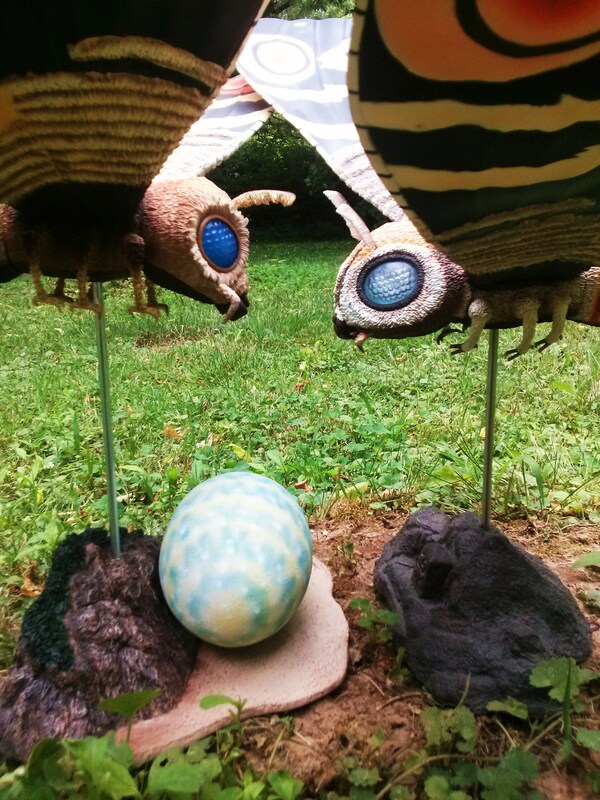 None other than the infamous Mothra Egg! 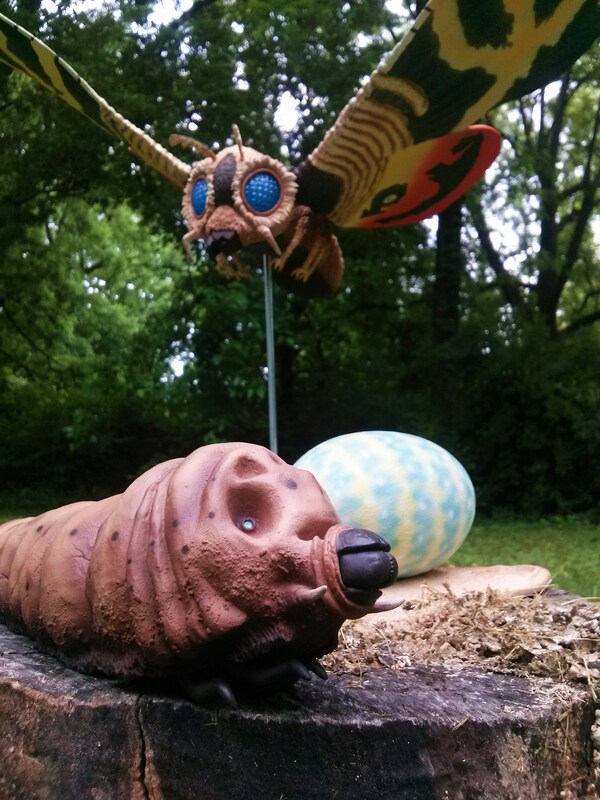 The egg itself is just as impressive as Mothra, which is kind of amazing. I was very much taken aback when I removed it from the box: This thing looks and feels like a real egg! They did a superb job with giving us a be-all-end-all representation of the egg. The base outside of the egg is also very well done, and includes a really nice touch: a MosuGoji footprint! How cool is that!? I was completely surprised to see it, and it’s a very cool little touch that honors the classic film’s two titans of terror. 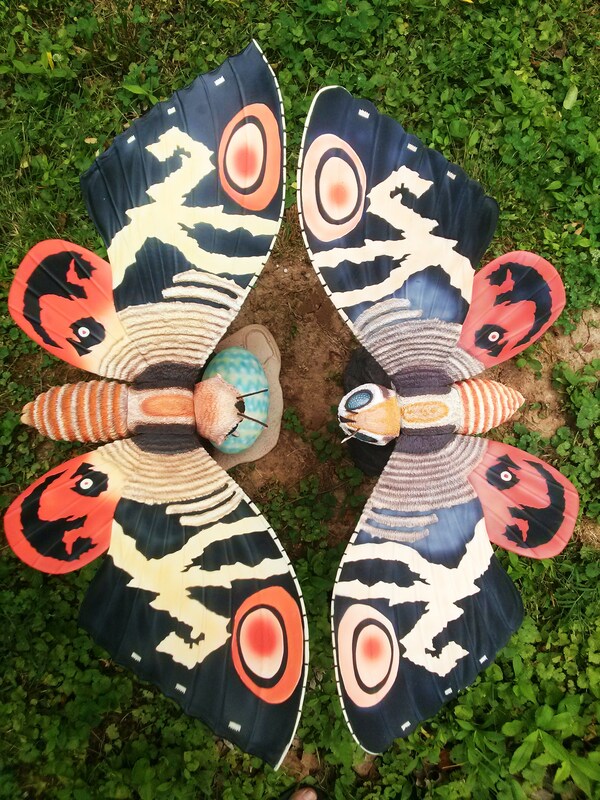 All in all, the 1964 Mothra is a much more vibrant and “showy” (pun intended) figure than the 1961. The colors on the wings really pop, as do all of the bright shades used to paint her body. She even manages to make the 1961 look de-saturated and dull, in comparison, which I actually like as that fits the spirit of the original Mothra film. Mothra’s appearance in the 1964 film is considered by many Kaiju Eiga fans to be her defining appearance, and an iconic look that represents the pinnacle of this character’s design (an honor the ’64 shares with the ’03 S.O.S iteration, iin my opinion). That being said, I am incredibly impressed with X-Plus’ 25cm Mothra 1964 – and very pleased they delivered a figure that lives up to such a beloved interpretation from such a masterful Toho classic. Beautiful! So cool. Would love to get all of these. Mothra stands for comfort. Next Post Lots of New Items on the KFM – From Jon @ UnCanny’s Collection!